Kimpton Flooring - Free Samples, Part of our Superior Service! We Realise that any Flooring purchase made can be for the long term, Possibly at a substantial outlay and so we want you to make the right choice and be happy with your new floor. Looking at small flat, low resolution pictures on computer screens of varying settings may not always truly represent the actual flooring product. We are therefore more than happy to post you actual small sample pieces of any materials that you may be interested in buying from us. Unlike most other 'Flooring Websites', The Kimpton Flooring Company makes no charge for this service and you are under no obligation to purchase from us. Please fill in your sample requirements or give as many details as possible if you require a written quotation by return Email. Full postal address of where samples are to be sent. Samples/Quotation required - Please state preferred colours, manufacturers, quantity and use if possible. Kimpton Flooring - Superior Service! We are sometimes able to answer Email questions and price requests during weekend and evening periods. Why not visit our Sales Showroom and 3 Large Warehouses full of Flooring Bargains? We ship Flooring materials out daily, Nationwide by next day Courier service or Pallet Line Express. We are open to the Trade and Public Monday to Friday from 8am until 5pm. 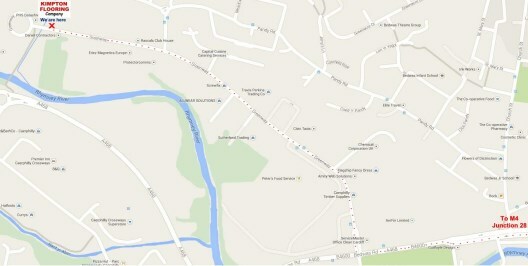 We are located just outside Caerphilly in Bedwas, Which is around 6 miles from Cardiff. Turning off junction 28 on the M4, Head along the A467 signposted Risca. At the end of the dual carriageway, go straight across the roundabout past Bassaleg school and then left at the next mini roundabout onto the A468 Caerphilly Road. Continue for about 6 miles through Machen, Trethomas and Bedwas. Turn right at the lights onto the Bedwas House Industrial Estate - We are at the very end of the road on the right, Just before the roundabout. Availability While every effort will be made to ensure that all products shown are in stock, we offer no guarantee of availability - Items listed do not constitute an offer for sale. Payment All goods must be fully paid for on collection or prepaid prior to sending out by courier service. Any goods that are for delivery outside the UK mainland, must be fully pre- paid by bank transfer or cleared cheque. Errors Pricing mistakes and or omissions to any of our web pages are not legally binding. Delivery All stock items sent out, usually arrive between 8am and 5.30pm, Monday to Friday normally within 1 - 3 working days of placing your order. We will call you if we are unable to deliver on this date, and to arrange an alternate date that is convenient to you. All product deliveries are made 'Kerbside' at the nearest access point to the delivery address for the delivery vehicle. The driver may require help unloading the products. As deliveries can be made on a large lorry or van, it is assumed that the delivery address will be accessible by lorry. If there is likely to be a problem, e.g. the road is subject to a vehicle weight or width limit please inform us at the time of order. If a delivery is attempted, and is unable to be delivered due to width or weight restriction, and you have not told informed us, you will be charged for re-delivery. In the event that you are not available to provide a signature on the pre-arranged date, you may be charged for re-delivery. If you live above the ground floor (i.e. in a flat) note that we are only able to deliver your goods to the ground floor entrance. We use third party delivery and courier company's and as such the drivers are unfortunately unable to move the goods inside for you. These couriers are only able to deliver flooring products to the outside of your home. Prices and VAT. The price shown for listed goods exclude postage and packing. All Flooring products and delivery prices quoted are exclusive of vat which will be added at the current rate. Applicable for Internet Sales only - In accordance with the Consumer Contracts Regulations 2014 you have the right to cancel your order, up to 7 days after you receive the goods but you would be liable for the return postage. If you wish to cancel a special order item or goods that have been already been sent out, you will be charged a re-stocking charge of 20% of the total amount of the purchase. If the order has already been delivered, the purchaser shall be liable for the return postage as well as the 20% re-stocking charge. We cannot accept returns for materials that have been specially made or cut to the buyers instructions as these are deemed to be tailor made. Every effort is made to ensure that your goods are delivered in perfect condition and we want you to be happy with what we sent you. Please inspect your goods immediately on delivery as no claims with regard to damaged items can be made after our driver has left the delivery address, unless signed for as damaged on delivery. Goods refused on delivery that are found to be undamaged on return to us will incur the return delivery charge where applicable. Damaged or faulty goods must be reported to us immediately, either by phone: 029 2086 2086, fax: 029 2088 5990 or by email to: sales@kimptonflooring.co.uk. We will then make further arrangements with you to rectify the problem. No claims can be accepted for returns due to any evident problems once materials are cut and or fixed. Any claims for proven faulty materials after installation shall be limited to cost of replacement materials only and not for subsequent costs, any other loss, associated cost's or damages. The colour of goods may vary slightly from that shown on the website due to limitations of browser software and monitors. We strongly recommend that you obtain actual samples of materials from us if in any doubt of colour or suitability. No materials can be accepted for return due to shading problems once cut and or fixed - Please ensure correct shade matching before cutting and laying. Our Flooring is available in many different colours, however any colour may be discontinued at any time without notice. In addition, each colour will vary from to batch to batch, it is therefore important to ensure that you accurately measure your floor, calculate the quantity of Flooring required and place one order for the total amount required. Please note that due to the colour varying from batch to batch there may be a slight difference in colour between the sample provided and the Flooring delivered and as with all vinyl and rubber Flooring, exposure to harsh sunlight or heat may cause Flooring to fade or discolour. Kimpton Flooring offer a full fitting and workmanship warranty for 12 months from date of installation covering any defective workmanship and or incorrect fitting procedure causing product failure. This warranty is in addition to any guarantee offered by the material manufacturer.